It can be hard to believe but I am a bit of a bargain hunter at heart. It’s a very rare occasion when I pay full price for anything beauty related because the discounts are always around, you just have to look for them. As it’s almost Christmas, everyone’s looking for ways to save money and get the best deal so I thought I’d lend a helping hand and share some of the ways I find the best beauty savings. This is going to be a long one so make a cup of tea, pull out your notepad and lets get started. The most obvious way to save is by using loyalty cards and it’s definitely one of the easiest ways too. If you purchase from a certain retailer quite frequently they're definitely worth looking into because those points will add up pretty quickly. 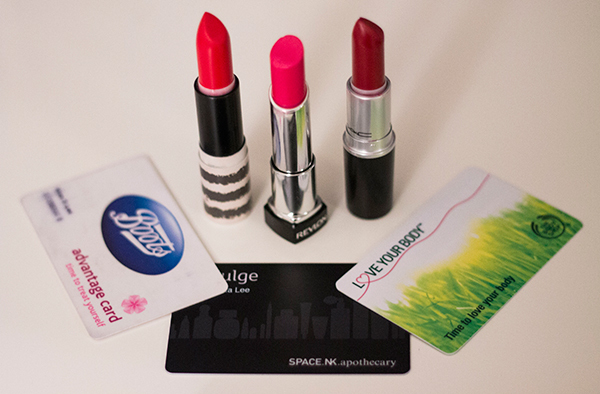 Now I don’t mean you have to sign up to every single card available but a few of my favourites are the Boots Advantage card, the Space NK N.Dulge card and The Body Shop Love Your Body card. The Boots card is probably the most generous with points and they send out double points vouchers all the time so you'll have a ton of points in no time. Plus it’s particularly handy for a Boots meal deal which I certainly took advantage of during uni. If you're more likely to buy high end brands, the Space NK card will be for you. Personally I don't shop in there too often but if there’s a sale on, I can't be held responsible for my actions. Basically every time you spend £100 you'll get £5 onto your card and you'll get a free gift on your birthday too. With The Body Shop card, you do have to spend £5 to get it but you get 10% off for a year, a gift on your birthday and after a few purchases you'll get £5 or £10 off for your next one so if you love The Body Shop it’s worth checking out. Of course these are specific to the UK but if you have access to a Sephora, their reward scheme sounds amazing. I rarely buy beauty products in person because it’s always cheaper buying online with access to discount codes. I'm not saying you should always buy without trying it in person but if it’s something you buy regularly then why would you pay more? It’s definitely worth typing the retailers name followed by discount code into google before you purchase but the best way to find them is signing up to newsletters. Back when I used to be obsessed with Clinique, I'd wait until a decent discount code came around and before you know it, I'd have my foundation plus around 7 decent sized samples in my order. Those mini mascara samples last just as long as the large ones and leave more room in your makeup bag. A few retailers I'd recommend are Cult Beauty, Origins, Clinique, Models Own and Asos who all include discounts and offers in their newsletters pretty frequently. Plus if you're a student, make sure you're taking advantage of your student discount while you can! Something a lot of people don't know about is cashback. Basically if you're signed up to a cashback website and make a purchase with a retailer in the cashback scheme, you'll get paid a percentage of the money you spent back to you. I can't vouch for others but I've never had nothing but positive experiences using Quidco. They have all the main websites like Boots, Superdrug, Debenhams, Feel Unique in the beauty section alone and often have a few discount codes along with the savings. I’ve found The Body Shop’s 16% cashback rate to be the most generous of them all and even works when they have their 50% off sales. It’s a very well known website and I'd never recommend anything I couldn't personally vouch for myself. Last, I thought I'd share some of my favourite places to shop and save. I can't imagine how much I'd have spent on delivery if I hadn't signed up to ASOS Premier. Basically for a one off £10 payment you get free next day delivery for a full year and free returns plus some other benefits like access to discounts before others and the occasional 20% off code. Not particularly beauty, but H&M always have at least 2 discount codes on the go, such as £5 off and 25% off which you can use at the same time for super savings. They do have a bit of a strange delivery process so if you don't mind waiting I'd really recommend shopping online with them. Plus, their homeware range is stunning! Last but not least is QVC. They sell a ton of beauty brands such as OPI, Nails Inc, Liz Earle, Bobbi Brown.. I could go on forever. You can easily pick up a collection of 8 Nails Inc polishes for £30, when they’re usually £11 alone so it’s definitely worth having a look and see what offers they have on. Also you can actually return it if you don't like it and get your money back which is basically unheard of in the UK when it comes to buying makeup! If you've made it this far, well done you! Hopefully you've managed to take away a few tips on how to spend a little less when it comes to beauty shopping. If you have anymore tips to share please leave them in the comments, I'd love to know!